It wasn’t a typical Sunday morning in Singapore’s Civic District. Freed of cars and the normal motorised traffic, claim to the streets was laid instead by hundreds of cyclists, joggers, walkers and roller-bladers for what was Singapore’s first Car-free Sunday. The first of six car-free Sundays planned for the last Sunday of each month from February, the initiative aims to promote a car-lite culture in Singapore. Organised by the Urban Redevelopment Authority (URA) in partnership with the National Parks Board (NParks), National Arts Council (NAC), Health Promotion Board (HPB) and Sport Singapore (SportSG), the event also saw a buzz come to some of the Civic District’s public spaces. One public space that came alive was the newly completed Empress Lawn at Empress Place. The lawn, part of a Civic District public space enhancement drive initiated by the URA, was a venue for temporary food stalls and mass exercise sessions – the food stalls perhaps a reminder of days when good and affordable food – now missing from much of the Civic District, had been one of the draws of the Empress Place area. A closed St. Andrew’s Road at first light. Representatives from the organisers together with Coordinating Minister for Infrastructure and Minister of Transport, Khaw Boon Wan and Minister for National Development, Lawrence Wong on the steps of City Hall for the flag-off. Robinson Road, which was partially closed. On Robinson Road. Minister Khaw Boon Wan and Minister Lawrence Wong who both cycled two rounds around a car-free circuit. The dogs had their day too. The flag-off for the Love Cycling in Singapore group. URA CEO Ng Lang and Francis Chu of Love Cycling Singapore at the flag-off. Temporary tables and benches set up at Empress Lawn. The buzz at Empress Lawn. Mass aerobics at Empress Lawn. Mr Khaw Boon Wan at Empress Lawn. Public art on the lawn – giant saga seeds. A roller-blader, a jogger and a cyclist coming down St. Andrew’s Road. After dominating the Kallang skyline for some 37 years, and some five months after heavy equipment was moved in and four months after demolition work started, we have seen the last of the Grand Old Lady. As of today, all that is left is a pile of twisted steel and broken concrete which supported as many as 70,000 in the days when the Kallang Roar had been in its infancy. We can now look forward to what promises to a new and exciting Sports Hub which will include new facilities such as a new 55,000 capacity National Stadium with a retractable roof, a 6,000 capacity indoor Aquatic Centre, a 3,000 capacity multi-purpose arena, and a Water Sports Centre, as well as integrate the existing Kallang Indoor Stadium into the complex. The sun sets on the former National Stadium (8 Feb 2011). The final trio (10 Feb 2011). A heap of twisted steel and broken concrete is all that is left (15 Feb 2011). A crane stands triumphantly over the defeated mess of steel and concrete. Two new icons of Singapore waiting to be joined by another. The phoenix that will rise out of the ashes - the Sports Hub is scheduled to be completed in April 2014. With the news carried by the local print media on Thursday that the demolition of the National Stadium has started, there has been much focus on the stadium itself and how it would remain in the hearts of the many Singaporeans who have sat on its terraces since it was built for the 7th South East Asian Peninsula (SEAP) Games in 1973. Having been a landmark in the Kallang area for close to four decades, the area would probably look a little bare once the grey icon and its four floodlight towers makes an exit from the landscape off Nicoll Highway and Mountbatten Road. 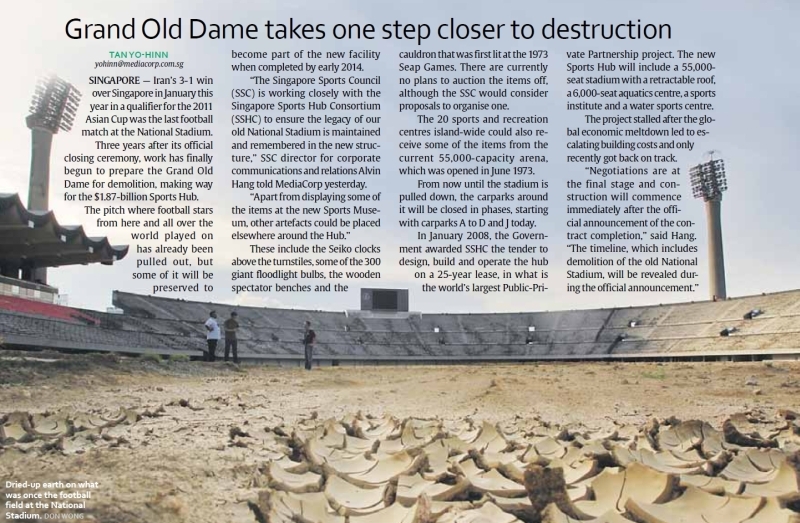 The Today report on the start of demolition at the National Stadium on 30 Sep 2010. Demolition work has began in earnest and access to roads in the vicinity of the stadium are now restricted (seen on 1 Oct 2010). 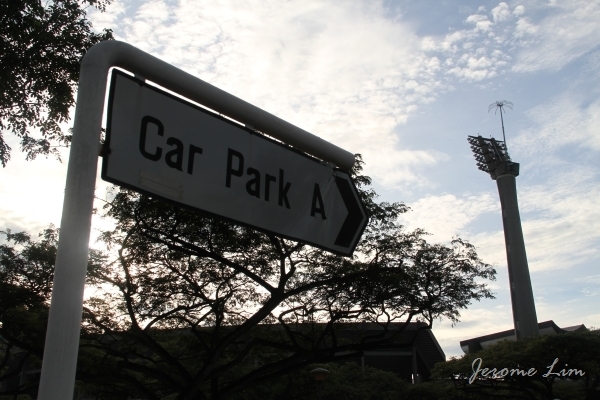 For me, the stadium always seemed an invariable part of the landscape in the Kallang area, one that stood firm despite the many changes that have overtaken the area around it since the days when it first dominated the area. Some of the sights familiar to me that had kept the stadium company in the earlier days of the stadium had since abandoned the Grand Old Lady. One of these was the bright and lively Guillemard Circus that I had always been fond of passing … with its colourful neon signs that transformed it into a wonderland of light at night – one that somehow I recall being dominated by the huge Knife Brand Cooking Oil advertisement. There was of course the old Wonderland Amusement Park that had my favourite ride – a roller coaster that I would persuade my parents to return to the park for time and time again – the Wonderland was in fact how I had first become acquainted with the area. Years later, I was to spend a short period of time at a shipyard on the banks of the Geylang River just by the area where the Wonderland was located, walking past the stadium from a bus stop in Kallang everyday to get to the area around Jalan Benaan Kapal which has since been transformed in a way that makes it had to imagine slipways lining what were dirty and muddy river banks. The newly constructed stadium was the most modern in South East Asia and provided an ideal setting for the birth of the Kallang Roar. The stadium had stood as a landmark in the area since it opened in 1973. The stadium being prepared for demolition on 28 Sep 2010. I have had over the 37 years had a love affair with the Grand Old Lady, one that started in 1974 with the first leg of the Malaysia Cup semi-final match played between Singapore and Penang. It was where I had first watched a football match live … and became part of the frenzied atmosphere that accompanied the matches played in the stadium featuring Singapore which became known as the much Kallang Roar. In its heyday, as many as 70,000 pairs of feet would stamp on the terraces combined with 70,000 voices that gave the stadium that thunderous blare that put fear in many visiting teams at the stadium. The stadium had often in its life been referred to as the “Lions’ Den”, not after the pair of stone Merdeka Lions that had once stood guard at the ends of the span of the Merdeka Bridge, being moved to stand guard at the area on which Stadium Boulevard had been constructed, but after the national football team which besides being referred to as the “Boys in Blue” – a reference to the sky blue jerseys they wore in the 1970s and 1980s, were also referred to as the “Lions”. The pair of lions also abandoned the stadium – sometime perhaps at the end of the 1980s. One of the floodlight towers that dominated the Kallang landscape. A lion watches sadly from across Nicoll Highway as the former Lions Den is being torn down. Whilst there were many that abandoned the Grand Old Lady, there had been a few that managed to stay with it throughout its life. Among those that have kept the stadium company were the nearby Police Coast Guard (Marine Police) headquarters which moved to Pulau Brani with the construction of the Marina Barrage, and a somewhat forgotten icon of the area: the Oasis Restaurant complex. The Oasis would be going the way of the stadium as well, having stood where it was for some forty years. Indeed the Oasis had been as much of an icon in the Kallang Park area since it was opened in 1969 as the Oasis Theatre Restaurant, Cabaret and Nightclub. Comprising a three storey main building and three auxiliary buildings built on stilts extending out some 100 metres over the Kallang Basin, the complex was a popular night spot for many years. The octagonal shaped auxiliary buildings which housed restaurants provided the complex with its distinctive character which Singaporeans immediately identified with the complex and provided a unique dining experience for many were completed in 1970 and operated until the closure of the complex a few years back. The octagonal shaped buildings and the three storey main building are also in the process of being torn down, and a feature that will also be missing from the area very soon. The former Police Coast Guard HQ near the stadium. The distinctive octagonal structures on stilts that used to be part of the Oasis Restaurant complex over the Kallang Basin. The 3-storey main building of the former Oasis being demolished (as seen on 28 Sep 2010). The octagonal buildings being reflected off the Kallang Basin. Once giving a distinctive character to the basin, the reflections of the basin will soon reflect only the sky (as seen on 28 Sep 2010). One of the octagonal buildings being demolished (as seen on 28 Sep 2010). With the icons of its past being dismantled, Kallang will no doubt never look the same again. That change is inevitable in land scarce Singapore is something that we as Singaporeans have come to accept. In the case of Kallang, the change is certainly necessary – one that will give Singapore a sorely needed modern sports hub that is sorely lacking at the moment. Still, there is that part of me that doesn’t want to let go … the part that will always remember Kallang fondly for the roller coaster rides not just that Wonderland brought with it, but the ones that the Lions took us on in the thrills and spills that accompanied their exploits in the Malaysia Cup. Vanishing scenes around Nicoll Highway. The north east floodlight tower looks like it would be the first of the four to come down. Heavy equipment has been moved to the site of the former National Stadium as preparation work is being carried out for its eventual demolition. Mobile cranes and parts of the fixed tower cranes that the mobile cranes will erect moved into the area in front of the East entrance last Friday. A fence is being erected around the former stadium ... and we would soon lose sight of it. The wooden seating in the gallery has been ripped out of the terraces. There were a few with doubts after the few false starts we have had on the construction of the Sports Hub, but it does looked as if the time has really come for us to say goodbye to the Grand Old Lady. That is on the evidence of the report and photograph in the sports section of today’s Today newspaper. Having already said a fond farewell to her, and to the area around her for which I have many fond memories of from the days passing by on my way to the shipyard which I was attached to in nearby Jalan Benaan Kapal, and from the many sports events I have attended, of which the Malaysia Cup and more recently the Tiger Cup football matches would be at the top of the list, I somehow feel that I must say goodbye again. So goodbye my old friend … and thanks so much for the memories you have given to me and to Singapore. The stadium at the beginning of June this year. It does look as if this time it is for real. The signs have come up to confirm that preparations are indeed being made for the long awaited and long delayed construction of the Sports Hub. The car parks around the old National Stadium would be closed from 16 July this year and from the sound of things, the National Stadium would be handed over to the Sports Hub Consortium and the demolition of the Grand Old Lady would be start after the close of the Youth Olympic Games in August. 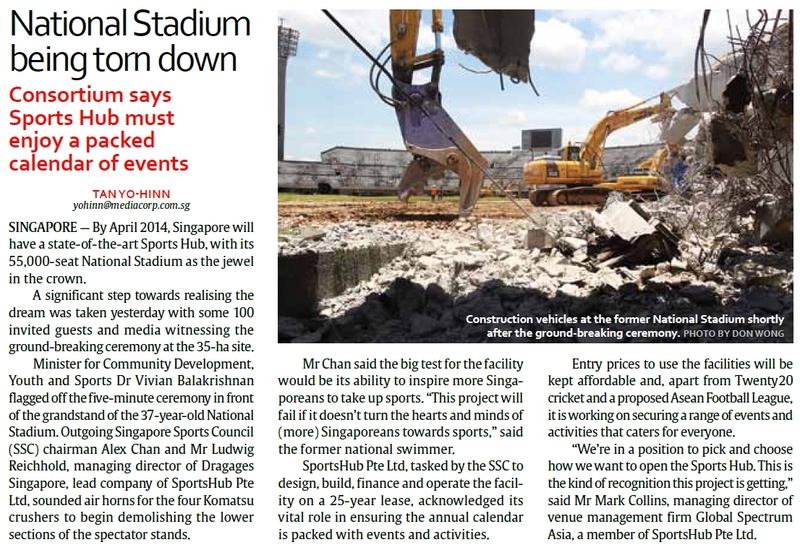 So after a few false starts, it does finally seem that we will be saying goodbye to our beloved National Stadium. The signs are up and this time it does look like the Grand Old Lady will take a bow. The area where the Sports Hub will be developed (source: Singapore Sports Council). The bus stop inherited from the City Shuttle Service (CSS) bus terminal. Bench at the bus stop. Close up of the end of the Bus Stop. The sun sets on the stadium floodlights. The old and the new. The stadium waits silently for its end next to the Kallang MRT station which has just had its beginning. Also soon to go ... the buildings that were the once well known Oasis Restaurant. The new icons of Singapore peeking out from behind the old. What used to be the Oasis over the Kallang Basin. The writing for the Oasis is on the wall? The Oasis from the promenade. Reflecting on the glorious old stadium. Clearing up would be a tremendous task. What's to become of this resident, a collared kingfisher, once the work starts? The policeman was a common sight. The Vuvuzela came to town long before the South African World Cup. The sun sets as the stadium waits in anticipation for the start of a match. A last look at the floodlights as they dim and go off forever.